September 03, 2018 at 11:30 am. Alabama quarterback Tua Tagovailoa will start Saturday’s game against Arkansas State, Crimson Tide coach Nick Saban said on Monday. Saban spent all summer avoiding any public statements about quarterbacks but Tagovailoa will get the nod over Jalen Hurts in the Crimson Tide’s home opener. “Everybody knows that Tua’s gonna start and we’re gonna use Jalen’s skill set in the future,” Saban told reporters Monday. 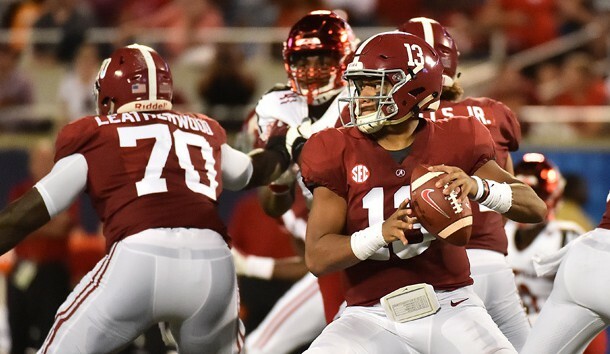 Tagovailoa came off the bench to lead Alabama to the national championship in January and made his first career start in Saturday’s 51-14 rout of Louisville in Orlando, Fla. The sophomore threw for two touchdowns and rushed for a TD while completing 12 of 16 passes for 227 yards. “Tua is instinctive and got the ball to the right place most of the time,” Saban said. Before Saturday, Hurts started 28 straight games and went 26-2. He did not appear against Louisville until the second quarter when Alabama was on its way to a blowout win. Hurts, the former SEC Offensive Player of the Year completed 5 of 9 passes for 70 yards on Saturday. During the summer, Hurts expressed frustration about the lack of communication regarding the quarterback job. Hurts intends to stay at Alabama through December when he is scheduled to graduate, but if he appears in four or fewer games he can take a redshirt and maintain a year of eligibility. Redshirting would allow Hurts to become a graduate transfer and play immediately with two years of eligibility left. Saban said he has not considered redshirting Hurts.